Danish designer Annemette Beck takes a creative new approach to textile design by utilizing an extremely inventive array of recycled materials. 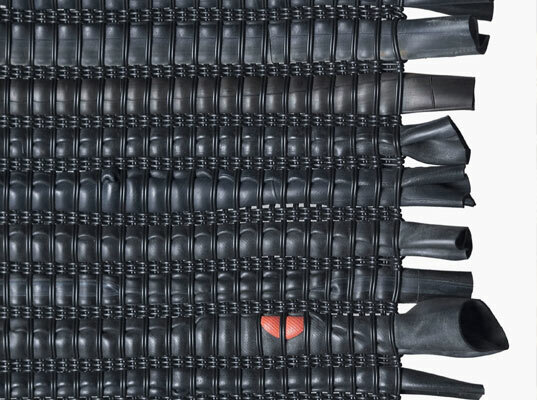 Her line of woven products include rugs, upholstery, fabrics, runners, blinds and even room dividers made from materials such as rubber, paper and metal. 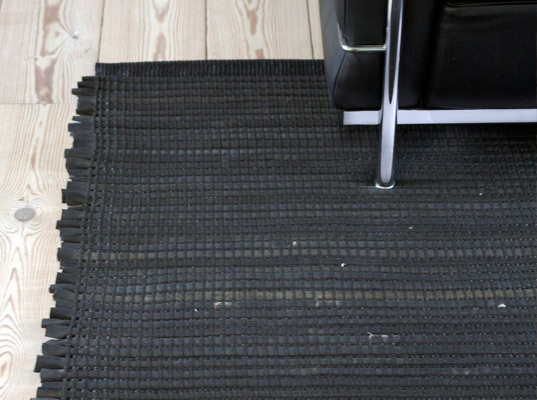 Beck’s experimental textiles showcase materials that can be salvaged and re-used — we are especially fond of the woven recycled bicycle tire area rug pictured above. Beck’s materials include but are not limited to paper yarn, rubber, silver, copper brass stainless steel threads, lurex, crystals, coated polyester, recycled bicycle tubes, plant fibers, wool, and linen. All of the fabrics are hand-made or factory woven and are all custom-made. Becks approach is simple and based upon Danish design principles — she celebrates the materials by removing anything that is unnecessary and leaving only what is essential. The designs tell a clear and distinct story with each independent construction. Those aren\'t bicycle tires. They\'re the innertubes. The tires would be far too stiff and inflexible for this use. Danish designer Annemette Beck takes a creative new approach to textile design by utilizing an extremely inventive array of recycled materials. Her line of woven products include rugs, upholstery, fabrics, runners, blinds and even room dividers made from materials such as rubber, paper and metal. Beck's experimental textiles showcase materials that can be salvaged and re-used -- we are especially fond of the woven recycled bicycle tire area rug pictured above.